From bank statements to health insurance records to bank transfer checks, there are a lot of sensitive paper documents that come through the mail. To ensure they don't end up in the hands of identity thieves, the Federal Trade Commission recommends shredding them. Not all shredders are created equal, though. You'll want a cross-cut model, with a security level of at least 3 or higher for confidential documents. That will reduce a 8.5" x 11" page to about 400 confetti-like particles. Shredders don't just do damage to documents, though. They're number three on our list of most dangerous tech products. So make sure you get a model that reduces the risk of accidentally getting a finger getting accidentally sliced. Some models have a deeply-recessed cutting mechanism. Others have sensors that stop the blades if they detect a hand near the insertion slot. You'll also want to consider the volume of documents you want to shred and whether you want your shredder to handle credit cards and CDs. Shredders can handle anything from a few hand-fed sheets at a time up to a fully-automated sheet-feeding bin. Here are our picks for light to heavy-duty home shredders. 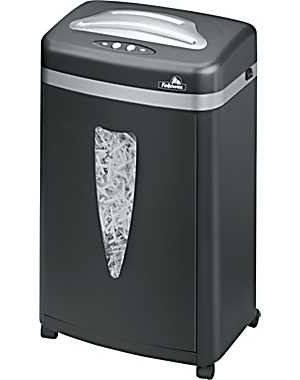 If you're just shredding your monthly bills and statements, the Fellowes DS-3 provides robust shredding in a footprint of a small wastepaper basket. It crosscuts up to 10 sheets at a security level 3 size of 5/32" x 2" into a five-gallon bin and has a built-in sensor that stops shredding when hands touch the paper opening. And its 9-inch paper entry slot makes sheet feeding easy. With the Swingline StackandShred, you can stack up to 100 sheets of paper in the StackandShred’s auto-feed bin, close the lid and the shredder will automatically begin the job of turning your personal data into security level 3 confetti. The shredder will handle credit cards, but not CDs, and has a 7-gallon waste bin with an indicator light that turns on when the bin is full. It’s pricey for a shredder, but the auto-feed function saves time and ensures its blades are safely hidden from curious kids' fingers and toys. For high-security work documents, you may want to step up to the Fellowes Powershred MS-450Cs micro-cut shredder with its security level 4 rating. It generates 5/64" x 5/16" particles, which are about 10 times smaller than a level 3 shredder, and handles CDs and credit cards. 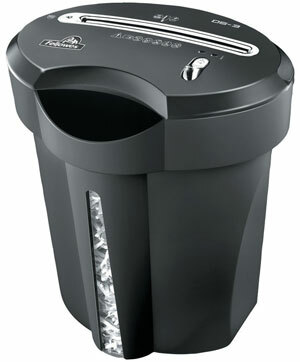 The finer particles compact more, so its 4.5-gallon bin can hold almost twice that of a level 3 shredder. 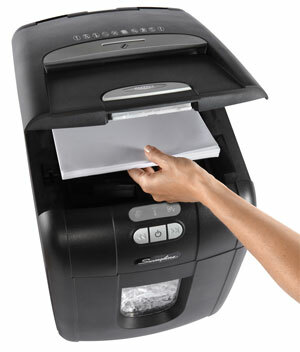 Like the DS-3, it has a sensor that stops the shredder when a hand touches the paper opening. Level 5 is suitable more for corporations the government is suppose to use a NSA/DOD rated level 6 minimum. Here is the issue with those shredded documents getting in the hands of the street. Most government agencies outsource document shredding at the rate to read tells me it’s amass machine that an employee failed to run a second or third run shredder operation. I’ve seen scam checks washing scams why so many companies prefer direct deposit. As too many corporations are doing payroll outsource processing. Rule thumb the larger the corporation or operations you work for most are outsourcing payment process, payroll, Human Resources and Billing Operations so you can get identity fraud via any large business that processes any transaction you do. About 80% are outsourcing now to home workers/telecommuters and independent contractors. Most this information may be floating around on laptops via these workers - in their own homes. Best recommendation invest in I.D. insurance but still no Guarantees it cost $50,000 to recover per court order done it twice! A college released all student records on the web not once twice!